In addition to practicing karate and tea ceremony, Honma balances his devotion to his family with a commitment to community, spending much of his time as an advocate of local culture. Recently he has re-dedicated himself to developing his distinctive style, separate from his well-known father. His work is included in the collection of the Ruth and Sherman Lee Institute for Japanese Art. In bamboo art, one usually learns traditional basket making before moving on to making bamboo sculpture. A student would learn the entire process of making a basket from start to finish. Contrarily, I started my artistic career late in life when I began assisting in my father Honma Kazuaki’s studio. He was one of the best-known bamboo sculptors in Japan and, at the same time, he owned a successful bamboo craft manufacturing business. Until the early 1990s, tourism in Sado Island, where we lived, was thriving, and Kazuaki’s bamboo broaches in particular were extremely popular. At the height of the business, he had a few dozen workers making a variety of bamboo articles and souvenirs that he’d designed. In 1986, I started helping with material preparation. The production studio was similar to a factory assembly line: some workers split bamboo, some did dye work, and some wove the strips. As Kazuaki’s oldest assistants began retiring, I was eventually given full responsibility for preparing (splitting, cutting, beveling) the material for bamboo broach production and also bent a lot of nemagari, a type of dwarf bamboo, for other small souvenir items. By splitting and bending bamboo every day for many hours, I became good at those skills, but I didn’t learn how to do anything else. Honma Kazuaki spent a couple of months out of the year creating his own art, which he submitted to annual spring and fall competitions. In time, I was allowed to observe and then to assist in his art making. Kazuaki’s favorite plaiting technique back then was matsuba-ami (pine needle plaiting), so I became familiar with that style of plaiting and its variant seikai-ami (blue ocean plaiting) before I even learned to make simple mutsume-ami (hexagonal plaited) baskets. 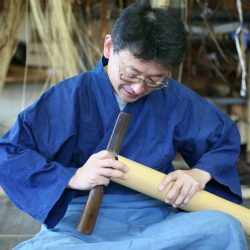 In 1990, I used my free time at night experimenting with making my own bamboo sculpture using these techniques. I had to overcome my technical limitations and lack of basic basket-making knowledge to translate my ideas into three-dimensional forms. Later that year, I made my first bamboo sculpture Snail, which I submitted to the Niigata Prefectural Art Exhibition. Without realizing it, I eventually developed a process similar to sculptors in different mediums. I sketch out many ideas and make small maquettes to realize them in three-dimensions. Once the scale is determined, I make an armature out of wood and look for the right bamboo to make my vision a reality. The final drawing is life-size, and I bend the nemagari over a flame carefully to match the lines on the paper. Once the nemagari has been shaped, I attach it to the armature, and it acts as the skeleton of the sculpture I intend to create. Then, I fill in the empty spaces with plaited bamboo. I adjust proportions and ensure that the piece has proper surface textures. I later learned that this process is rather unique among bamboo artists. Other bamboo sculptors usually work from the bottom up in a manner similar to making a basket. In the beginning, I thought not knowing the basics of basket making was a disadvantage, but it actually allowed me to think freely and helped me develop my own method and personal style.